The name of Benelli is of course well known in the world of motorcycles since it was founded back in 1911 and has turned out many Champions in various events. It is not however well known in the world of Dirt Track racing, and although we had heard of such a machine, it wasn't until Franco Oliani unearthed some pictures and information for us that we have been able to gladly add it to our Pages. It appears these pictures of this elusive machine were taken recently during a motor show held in Pesaro. As regards the story behind this interesting motorbike, I still have to gather certain information. I think the engine is a 500cc (maybe with a reduced stroke) single-exhaust pipe, which powered one of the roadsters Benelli's firm produced just before World War Two. Anyhow, it's a SOHC driven by a 'cascade' of gears. It has magneto ignition and separate gearbox (the one used By Bon might be a Clubman). The oil tank is in the engine sump and the oil pump is adjustable from the outside (have a look at the engine front). There's also a small oil-cooler which Bon removed. 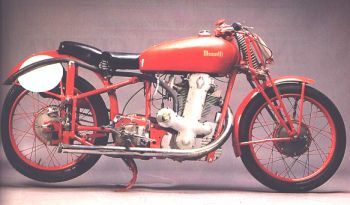 I enclose also a picture of the Benelli 500 TSS owned by the great Dario Ambrosini, (See Below) whose achievements, as a road racer, include a world title and a TT win (sadly, he lost his life at his power's peak in 1951). To tell the truth, the Benelli 500 TSS is a very rare machine, very few copies were produced (the 250cc version was slightly commoner). 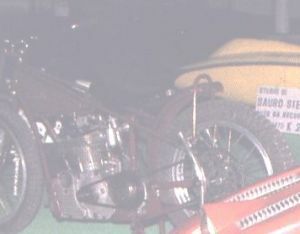 In the post war years the single-exhaust pipe spare heads, produced by the firm, were bought by riders so as to convert the pre war 'touristic' roadsters (which had two exhaust pipes). Maybe Bon used one of these 'conversions' to power his Benelli 'special'. I should hear the whole story from the horse's mouth!.